Marking the entrance to Port Clyde Harbor. The grounds, which also include the keeper’s house which is the current Marshall Point Lighthouse Museum, are open to the public. Visitors are also allowed to cross the walkway to the lighthouse. 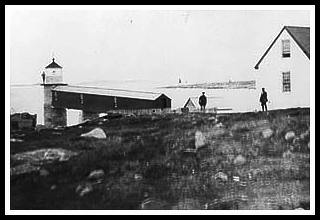 In the 1800’s when Port Clyde became a busy shipping port for granite, timber, and fishing along with becoming a haven for writers and artists as it still is today, Marshall Point lighthouse was finally constructed in 1832 to accommodate traffic entering and leaving the harbor. The keeper who served the station for the longest period was Charles Clement Skinner, a Civil War veteran who worked at Marshall Point from 1874 to 1919 (the longest tenure of a keeper at the same light in the Lighthouse Service history). Of his six children, his two youngest daughters, Eula (1891-1993) and Marion (1895-1992) lived at or by the lighthouse during their entire extraordinary long lives. Marion lived her later years with her sister until her death in 1992. In 1895 the original lighthouse was destroyed by lightning and was rebuilt in the same location. In 1935, Marshall Point was converted to electricity, and was automated in 1971. The lighthouse gained worldwide notoriety when it appeared in the 1994 movie Forrest Gump. It was the lighthouse Tom Hanks ran cross country to, then decided to turn around with his followers. Port Clyde, Thomaston, and Tenants Harbor, along with their neighboring villages and towns are still predominantly fishing villages, where you’ll also find many artists galleries, beautiful sunsets overlooking their harbors, and where visitors will find the true Maine spirit. Over twenty-five artists in the town of St. George hold an annual Open Studio Tour each summer. Thomaston is an old seaport that is noted for its antique architecture. To view some of the local history of what occurred during the Revolution, visit the Henry Knox Museum. Port Clyde is still a fishing village and an artists haven with many galleries to look at, and has beautiful sunsets overlooking the harbor. The area itself is picturesque and out of the way down a long peninsula to the village of Port Clyde offering activities like hiking, biking, fishing, kayaking, sailing and golf. The Marshall Point Lighthouse Museum in the keeper's house and the grounds are open to the public. For those who are looking for a hands on education in marine life in the area, Herring Gut Learning Center is a non-profit marine education and resource center in Port Clyde. The Monhegan Boat Line provides various nature tours and ferries tourists to Monhegan Island from the dock at Port Clyde. 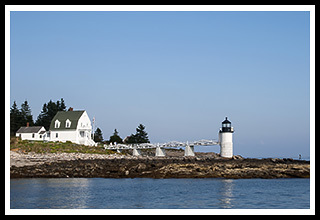 Port Clyde Kayaks offers tours around Marshall Point Lighthouse and the surrounding coastal area, and out to Pemaquid Point Light depending on your experience level. They also provide tours out to neighboring Georges Islands. 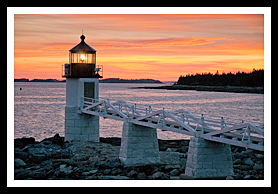 There is also the annual Mid Coast Maine Lighthouse Challenge usually in late June, put on by the American Lighthouse Foundation (headquarters at Owl’s Head keeper’s house), offering a chance to view up to seven lighthouses along the coast and providing special cruises out of Port Clyde. From US Route 1 in Thomaston take Route 131 South to Port Clyde. At the main intersection turn left, then take a right immediately after the restaurant. The unmarked but paved Marshall Point Road will lead you a mile to a very small parking lot at Marshall Point Light. Cruises mentioned below offer many types of cruises. Each provide special lighthouse cruises around Marshall Point Lighthouse. Provide kayaking tours around Marshall Point Lighthouse and Muscongus Bay area. Ferry leaves out of Port Clyde to Monhegan Island, other tours also including a special local lighthouse tour. 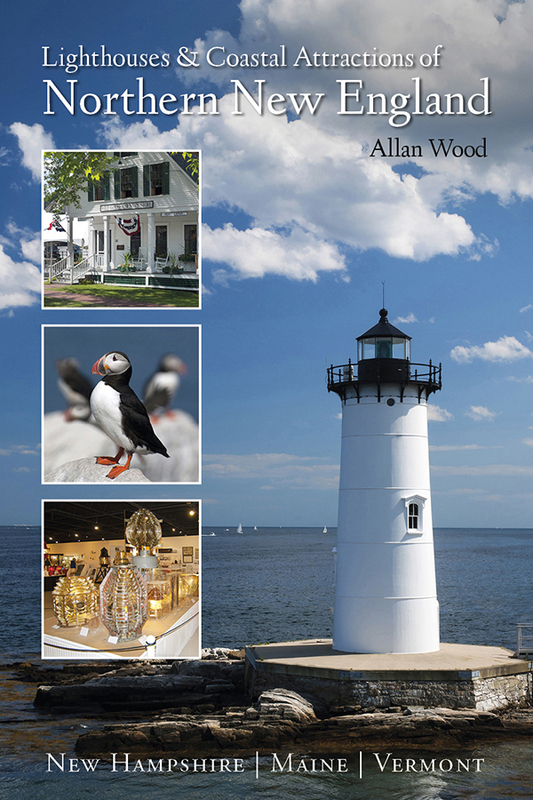 My 300-page book (with over 360 images), Lighthouses and Coastal Attractions of Northern New England: New Hampshire, Maine, and Vermont, provides human interest stories from each of the 76 lighthouses along this northern coastline, along with plenty of coastal attractions and tours near each beacon. ©Allan Wood Photography, not for commercial use, educational use only. Do not reproduce without permission. All rights reserved. Privacy Statement.